Sapphire Secrets by Dawn V Cahill is a Christian romantic novel and the first book in the Seattle trilogy. I absolutely loved it. Sapphire Secrets is set around a mystery – twins Livy and DeeDee found their mother dead but twenty years later Livy still cannot remember exactly what happened. Though only six years old at the time, Livy suffered from PTSD. The novel shows how sufferers can continue to struggle until they get professional help. PTSD affects every area of your life including your sleeping. Religion will never change a person’s life. “Religion isn’t enough.” Many bad things have been done in the name of religion. Christianity is all about knowing Jesus and having a relationship with Him. “Being a Christian in name only won’t get a person into heaven.” Knowing Jesus and doing life in tandem with Him is what it’s all about. The novel also places emphasis on the Bible. “Do you believe the message of the book…what will you do with it?” It is not enough to read the words. One needs to live out one’s faith and obey the Biblical teaching. There are the twin themes of forgiveness and grace in Sapphire Secrets. Forgiveness can be difficult to give to others. We may feel they need to suffer and do not deserve forgiveness. However we all need forgiveness and by God’s grace we receive it. We too, need to extend grace and forgiveness. Within the novel there is the search for the truth. Knowing the truth will bring freedom. Freedom from the haunting nightmares. Freedom from the pain of not knowing. Freedom from the past. There are uncomfortable themes of drugs and new age religion within the novel. These are both sensitively presented by Dawn V Cahill. There is also the theme of money within the novel. “We have a million piggy banks worth of money by now.” Money in itself is not bad. It is the love of money that is the root of all evil. Those who love money and are driven by it will never prosper. Money can be used for good but to be motivated by it is wrong. 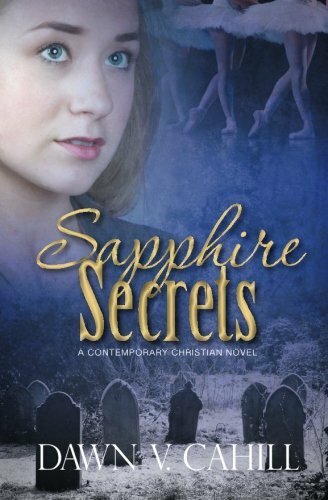 Sapphire Secrets was my first novel by Dawn V Cahill and I absolutely loved it. I love it when I ‘discover’ a new author. I cannot wait for the subsequent books in the trilogy. Remember the name – Dawn V Cahill – I think she could be an author we shall all be reading. Give Sapphire Secrets a read today.